The awarding ceremony “The Person of the Year” organized by the TV company “Noyabrsk 24” took place in the town Noyabrsk, Yamal-Nenets Autonomous Okrug. Andrey Alekseev was awarded with the grand-prix. He was given a standing ovation. He alone raises a daughter Svetlana. She has infantile cerebral paralysis. 9 years ago, when a girl was 12 years old, her mother died. Her father was not afraid of difficulties. He dedicated his life to his daughter. The family has difficulties, but they steadfastly withstand all the hardships of life. They are dreaming about their own home, saving money for own housing. Andrey does his best to make life of his daughter more comfortable: he cooks, tidies up, does laundry. In evenings they like to go for a walk. Once Svetlana wished to walk herself, without a wheelchair. She walked 100 meters and stopped, she had no strength to go further. “Now we do not risk, we know that we cannot do without a wheelchair in any way. And Svetlana accepted that”, her father said. She became interested in geography, studies the map, downloaded a special application and also watches programs about travels. The girl learns poems by heart and recites them. Earlier the girl visited events of the public organization “Unusual children of Noyabrsk”, but then stopped. She had one argument – all are small there. It was a transition stage. Now she again wants to go there, as there is not enough communication, as her father says. The girl made an account in social networks, communicates with her sisters. She has three sisters: two in Chuvashiya and one in Chelyabinsk Oblast. It is easy for her to communicate through the computer, but it is difficult to speak. The man can talk for hours about Svetlana; he breathes and lives for her. Their family has a friend — a good woman, and he is happy that Svetlana has someone to share their women’s secrets. On weekends they cook for the whole week ahead, and he considers these days happy. Sometimes Svetlana’s favorite food is ordered — sushi rolls and pizza — and joy reigns in the house. 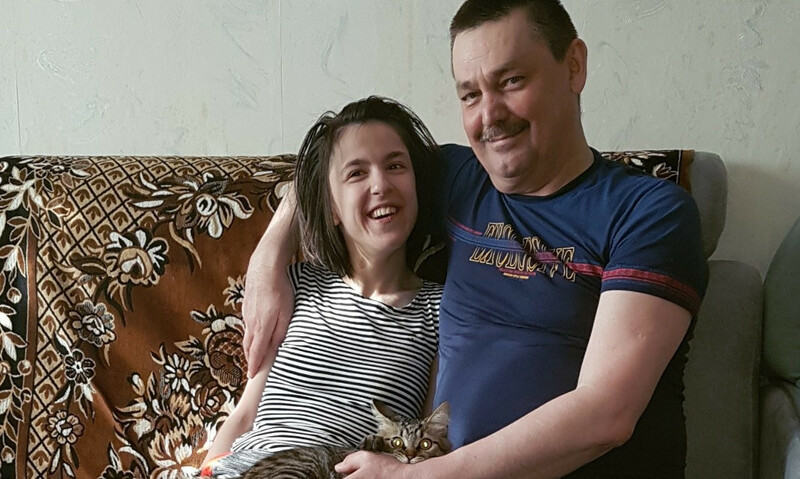 Happy is Svetlana, happy is her father. When asked “what is the family’s cherished dream”, Andrey, without thinking for a minute, says: “Svetlana wants to find a friend. And I really want her to find someone to be friends, and her dream would come true”. The chairperson of the local public organization “Unusual children of Noyabrsk” Milyausha Molostvova tells that Andrey is very a decent, responsible person. “He’s a workaholic. He takes care of his daughter. For many years of work with unusual families of Noyabrsk I know firsthand how hard it is to raise a disabled child alone. Many mothers can not stand and cope, and he alone brought up and raised his girl. He has so much will power, we can only admire him. He always refuses to receive help, says they can cope themselves. At the same time, he always helps our public organization. For his daughter he even went to the dance. Low bow to such fathers, he is a worthy “Person of the Year” and a vivid example for others”, she underlined. Photos from the personal archive of the family are published with the permission of Andrey Alekseev.